Corvette ZR1 | What Car? 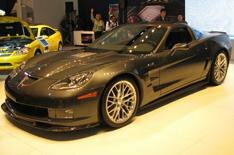 This is the ZR1 supercar, the fastest-ever car to come from Corvette. Powered by a supercharged 6.2-litre V8 engine, it has 620bhp, 595lb ft of pulling power and a top speed of at least 200mph. The ZR1 is based on the same aluminium chassis as the Z06, and uses carbonfibre in the bodywork to bring the kerbweight down to 1519kg. That gives the ZR1 408bhp per tonne - over 50bhp per tonne more than the Z06, and a better power-to-weight ratio than the Lamborghini Murcielago LP640 and Ferrari 599 GTB Fiorano. It features a racing-specification six-speed gearbox, a heavy-duty clutch to cope with the power and carbon-ceramic brake discs to reduce stopping distances. Handling is boosted by a system called Magnetic Selective Ride Control, which uses electronically controlled shock absorbers filled with a fluid that reacts to magnetic pulses to give almost instant adjustment to road conditions. The ZR1 will go on sale this summer, with buyers able to upgrade by selecting chrome wheels or a Luxury package that includes power-adjustable, leather-trimmed sports seats, a full leather interior, satellite-navigation and Bluetooth connectivity. Prices haven't been announced, but with just 3000 being made globally a year, the few examples that make it to the UK will be at a premium, costing around 100,000.